SCORE TROPHY TRUCK (Unlimited Custom Trucks)—1. 11 Rob MacCachren, 53, Las Vegas, Ford F-250 (Geiser), 5:20:17 (59.76 miles per hour); 2. 16 Cameron Steele, 50, San Clemente, Calif., Chevy Silverado (Geiser), 5:23:50; 3. 83 Luke McMillin, 25, San Diego, Ford F-150 (Racer), 5:25:10; 4. 31 Andy McMillin, 30, San Diego, Chevy Silverado (Mason), 5:26:14; 5. 32 Ryan Arciero, 44, Lake Forest, Calif., Ford F-150 (Herbst-Smith), 5:32:16; 6. 23 Dan McMillin, 30, La Mesa, Calif., Ford F-150 (Racer), 5:35:23; 7. 24 Adam Householder, 33, Yorba Linda, Calif./Wayne Gould, 51, Anaheim, Calif., Ford F-150 (Herbst-Smith), 5:39:43; 8. 10 Alan Ampudia, 27, Ensenada, Mexico/Aaron Ampudia, 25, Ensenada, Mexico, Ford Raptor (ID), 5:40:16; 9. 7 Justin ‘Bean’ Smith, 34, Las Vegas (DOR-Bryce Menzies, 30, Las Vegas), Ford Raptor (Geiser), 5:51:04; 10. 40 Chris Miller, 44, LaJolla, Calif./Jimmy Nuckles, 50, Brawley, Calif., Toyota Tundra (ID), 5:53:38; 11. 19 Tim Herbst, 54, Las Vegas, Ford F-150 (Herbst-Smith), 5:53:58; 12. 51 Steve Olliges, 54, Las Vegas/Mark Newhan, 50, Lakeside, Calif., Ford Raptor (Geiser), 6:08:38; 13. 2 Carrie Smiley, 48, Buckeye, Ariz. (DOR-Tony Smiley, 47, Buckeye, Ariz.)/Jeff Geiser, 51, Phoenix, Chevy Silverado (Geiser), 6:26:35; 14. 18 Juan C. Lopez, 43, Tecate, Mexico, Ford Raptor (Racer), 6:33:52; 15. 26 Dave Taylor, 44, Page, Ariz., Ford F-150 (Geiser), 7:42:17; 16. 6 Ricky Johnson, 53, Trabuco Canyon, Calif. (DOR-Larry Connor, 68, Miamisburg, Ohio), Chevy Silverado (Mason), 8:03:29; 17. 30 Robbie Pierce, 58, Santee, Calif./Mike Julson, 60, Descanso, Calif., Ford Raptor (Jimco), 9:05:00;18. 85 Mike Lawrence, 30, Banning, Calif., Ford F-150 (Herbst-Smith), 9:26:04; 19. 77 Robby Gordon, 49, Charlotte, N.C., Chevy Silverado (Custom), 9:28:34; 20. 15 Billy Wilson, 32, Corpus Christi, Texas, Ford Raptor (Jimco), 12:57:56; 21. 1 Carlos ‘Apdaly’ Lopez, 23, Tecate, Mexico, Chevy Rally Truck (Geiser), 14:17:34; 22. 97 B.J. Baldwin, 38, Las Vegas, Toyota Tundra (ID), 14:53:23; 23. 45 Chelsea Magness, 30, Denver (DOR-Gary Magness, 64, Denver), Ford F-150 (Custom), 15:16:02. SCORE TT LEGEND (Unlimited Production Trucks, Drivers over 50 years old)—1. 79L Russell Buehler, 59, Liberty, Mo./Wes Uhlig, Kansas City, Mo., Ford Raptor (Jimco), 7:03:46 (45.17 mph); 2. 12L Gustavo Vildosola, 64, Mexicali, Mexico/Scott Bailey, 58, Riverside, Calif., Ford Raptor (ID), 7:03:49; 3. 5L Clyde Stacy, 73, Bristol, Va./Armin Schwarz, 54, Austria (Germany), Chevy Rally Truck (Geiser), 8:29:55. CLASS 1 (Unlimited open-wheel single or two-seaters)—1. 185 Justin Davis, 24, Chino Hills, Calif., Jimco-Chevy, 6:03:38 (52.64 mph); 2. 100 Brian Wilson, 32, Lakewood, Calif./Kyle Quinn, 30, Lakewood, Calif., Jimco-Chevy, 6:05:44; 3. 153 Brad Wilson, 28, Long Beach, Calif./Justin Munyon, 32, San Clemente, Calif., Jimco-Chevy, 6:14:48; 4. 155 Brad Vicic, 48, Littleton, Colo., Racer-Chevy, 6:40:22; 5. 168 Shelby Reid, 50, Apple Valley, Calif./Danny Ebberts, 36, Menifee, Calif., Jefferies-Chevy, 6:48:20; 6. 188 Sergio Salgado, 41, Mexicali, Mexico, Jimco-Chevy, 6:59:01; 7. 118 Ricardo Malo, 47, Mexicali, Mexico, Jimco-Chevy, 8:02:12; 8. 106 Derek Fletcher, 33, Arlington, Va./Christyan Samano, 28, Ensenada, Mexico, Tatum-Chevy, 8:47:17; 9. 129 Brandon Bailey, 36, Riverside, Calif./Larry Job, 53, Las Vegas, Custom-Chevy, 10:07:06. TROPHY TRUCK SPEC (unlimited Truck/SUV, stock, sealed engines)—1. 295 William Hedrick Jr, 22, Vicente Guerro, Mexico/German Encinas, 42, Ensenada, Mexico, ID-Chevy, 6:41:43 (47.65 mph); 2. 242 Bryce Swaim, 30, El Cajon, Calif./Garrett Stone, 24, El Cajon, Calif./Austin Jones, 22, Litchfield Park, Ariz., TSCO-Chevy, 6:47:27; 3. 251 Rafael Navarro IV, 24, Temecula, Calif./Rafael Navarro III, 49, Temecula, Calif., Ford Raptor, 6:51:39; 4. 200 Elias Hanna, 35, Ensenada, Mexico, HN-Chevy 1500, 6:52:21; 5. 220 Craig Christy, 43, Burbank, Calif. /Ricardo Salatino, 30, Whittier, Calif., Brenthel-Chevy, 6:55:03; 6. 225 Brian Trotter, 46, Hardtner, Kansas/Jonathan Bickel, 51, Fort Worth, Texas/Nathan Rees, 25, Phoenix, Ariz., Mason-Chevy, 7:45:58; 7. 235 Derek Hunter, 37, Lubbock, Texas/Jonathan Faulkner, 19, Las Cruces, N.M., Brenthel-Chevy, 8:01:24; 8. 266 Scott Biernot, 51, Hermosa Beach, Calif./Johnny Crego, 56, San Bernardino, Calif./Phil Casey, New Zealand, Geiser-Chevy, 8:05:38; 9. 252 Gonzalo Pirron, 45, Lancaster, Calif./Steve Myers, Escondido, Calif., Jefferies-Chevy, 8:16:55; 10. 250 John Langley, 74, Manhattan Beach, Calif./Steve Hengeveld, Flagstaff, Ariz., Mason-Chevy, 10:05:30; 11. 222 Pete Sohren, 53, Phoenix/Van Sohren, 18, Phoenix, BajaLite-Chevy, 11:44:56; 12. 204 Sara Price, 25, Lake Elsinore, Calif., Geiser-Chevy, 15:08:03; 13. 276 Gerardo Iribe, 41, Miami, Fla. (Rosarito Beach, Mexico)/Gerardo J. Iribe, 18, Santa Ana, Calif., Curry-Chevy 1500, 15:58:52. CLASS 10 (Limited, sealed engine, single or two-seaters)—1. 1008 Chase Warren, 28, Phoenix, Ariz./Martin Richardson, 41, La Mesa, Calif., Alumi Craft-Chevy, 6:35:44 (48.37 mph);2. 1036 Corey Goin, 55, Clovis, Calif./Robbie Suprenant, 32, Lake Havasu City, Ariz./Chris Himmelrick, 34, Petaluma, Calif., Alumi Craft-Chevy, 6:45:26; 3. 1068 Cody Reid, 25, Apple Valley, Calif./Adam Pfankuch, 36, Carlsbad, Calif., Alumi Craft-Chevy, 7:06:02; 4. 1011 Cesar Cuevas, 42, Chula Vista, Calif./Moises Cuevas, 38, Chula Vista, Calif., Alumi Craft-Chevy, 7:16:27; 5. 1081 Todd Winslow, 53, Clovis, Calif./Matt Winslow, 25, Clovis, Calif., Alumi Craft-Chevy, 7:18:48; 6. 1062 J.J. Schnarr, 45, Reno, Nev./Roberto Romo, 36, Mexicali, Mexico, Alumi Craft-Chevy, 7:40:57; 7. 1078 Augie Cortez Jr, 40, Downey, Calif., Wicked-Chevy, 8:26:23; 8. 1049 Ty Godde, 47, Palmdale, Calif./Steve Hext, 42, Lancaster, Calif., Eversen-Chevy, 8:45:29; 9. 1048 Kevin Price, 49, Fremont, Calif./Brian Tall, 42, Fremont, Calif.,Tatum-Chevy, 8:47:18; 10. 1013 Harley Meservey, 47, Coos Bay, Ore., Fusion-Chevy, 9:05:32; 11.1066 Dave Mason Jr, 24, Valley Center, Calif./Dave Mason Sr, 56, Valley Center, Calif./Josh Nelson, 45, Carlsbad, Calif., Alumi Craft-Chevy, 10:31:33; 12. 1019 Luis Ritchie, 22, San Luis Rio Colorado, Mexico/Jaime Huerta Jr, 22, Mexico, Jimco-Chevy, 10:40:37; 13. 1023 Broc Dickerson, 17, Brawley, Calif./Jeff Dickerson, 43, Brawley, Calif., Alumi Craft-Chevy, 11:22:14. CLASS 8 (Full-sized two-wheel drive truck/SUV, no displacement limit)—1. 894 Vincent Munoz, 31, Yucaipa, Calif./Roy Tomkins, 34, Redlands, Calif./Steven Yates, 32, Yucaipa, Calif., Ford Ranger, 7:48:29 (40.86 mph); 2. 809 Eduardo Ramirez, 40, Tecate, Mexico/Miguel Ramos, 25, Tecate, Mexico/Javier Bonilla, 45, Tecate, Mexico, Chevy Silverado, 10:04:35; 3. 869 Juan Carlos Calderon, 24, Santa Maria, Calif./Eric Vences, 29, Santa Maria, Calif., Ford Ranger, 11:33:53. CLASS 1/2-1600 (VW-powered, single or two-seaters to 1600cc)—1. 1614 Bruce Yee, 18, Chula Vista, Calif./Angel Barajas, 41, Ensenada, Mexico, Barajas, 8:29:44 (37.55 mph); 2. 1678 Gustavo Avina, 45, Ensenada, Mexico/Erik Rivera, 32, Ensenada, Mexico/Gabriel Avina, 25, Ensenada, Mexico, Dethomas. 8:45:53; 3. 1603 Oscar Alvarez, 41, McAllen, Texas/Ramon Bio, 19, Ensenada, Mexico/Fernando Alvarez, 37, San Antonio, Texas/Adrian Guerrero, 30, Ensenada, Mexico, Romo, 8:46:29; 4. 1623 Mario Estrella, 25, Caborca, Mexico/Roberto Romo, Mexico/Ruben Aburto, Ensenada, Mexico/Guillermo Garcia, Hermosillo, Mexico, Romo, 9:46:42; 5. 1693 Jesus Acedo, 20, Hermosillo, Mexico/Alejandro Reyes, 46, Hermosillo, Mexico/Jose Lopez, 27, Mexicali, Mexico/Yoshua Morquecho, 23, Mexicali, Mexico/Guillermo Garcia, 43, Hermosillo, Mexico, ORP, 10:15:17; 6. 1613 Dana Jussila, 47, Coos Bay, Ore./Dave Morlan, Coos Bay, Ore., Jimco, 15:00:28; 7. 1627 Carlos Castaneda, 31, San Felipe, Mexico/Mauricio Perez, 18, San Felipe, Mexico/Antonio Perez, 27, San Felipe, Mexico/Leonardo Gutierrez, 38, San Felipe, Mexico, Chenowth, 15:33:36. SCORE LITES (VW-powered, Limited single-1776cc-or two-seaters-1835cc)—1. 1210 Luis Barragan, 53, Mexicali, Mexico/Edgar Yepiz, 36, Mexicali, Mexico/David Garcia, 45, Mexicali, Seagrove, 8:14:07 (38.74 mph); 2. 1258 Jeremy Davis, 17, Chino Hills, Calif., Porter, 8:35:57; 3. 1240 Miguel Bonilla, 46, Hermosillo, Mexico/Antonio Gaxiola, 24, Mexicali, Mexico, Jimco, 9:30:24; 4. 1236 Guillermo Arteaga, 47, Chula Vista, Calif./Kevin Derby, 50, Parker, Ariz./Carlos Albanez, 48, San Diego/Gabriel Cruz, 22, Mexicali, Mexico, Chenowth, 9:40:34; 5. 1255 Darren Walsh, 50, Long Beach, Calif./Michael Rodriguez, 42, Lakewood, Calif./Cesar Lara, 38, Lakewood, Calif., Eversen, 11:12:26. CLASS 7 (unlimited, six-cylinder, production appearing trucks or SUVs)—1. 721 Mike Coleman, 51, La Jolla, Calif./Omar Preciado, 41, San Diego, Ford Raptor, 7:15:01 (44.00 mph); 2. 711 Carlos Diaz, 41, Calexico, Calif./Manuel Lopez, 46, Mexicali, Mexico/Hugo Martinez, 29, Mexicali, Mexico, Ford Raptor, 8:45:23; 3. 715 Daniel Reyes Jr, 39, Heber, Calif./Jose Ahumada, 35, Mexicali, Mexico/Cesar del Real, 17, Mexicali, Mexico, Ford Raptor, 9:02:48; 4. 700 Dan Chamlee, 55, Montecito, Calif./Kurt Kimball, 57, Santa Barbara, Calif., Ford Ranger, 9:05:19; 5. 717 Mike Perez, 35, Houston/Manuel Rico, 47, El Paso, Texas/Cisco Bio, 36, Spring Valley, Calif., Chevy Silverado, 10:01:32. CLASS 5 (Unlimited Baja Bugs, VW concept engines allowed)—1. 501 Mark McNeil, 24, El Cajon, Calif./Perry McNeil, 67, San Diego, 7:33:32 (42.20 mph); 2. 524 Ben Swift, 28, Newport Beach, Calif./Pete Swift, 62, Newport Beach, Calif., JFW-Chevy, 8:38:52. PRO UTV FI (two-seat Forced Induction, OEM engine UTVs)—1. 2971 Wayne Matlock, 40, Alpine, Calif./Daniel Felix, 27, Tecate, Mexico, Polaris RZR XP4 Turbo, 7:25:04 (43.01 mph); 2. 2977 Justin Elenberg, 40, Mesa, Ariz./Ernesto Taylor, 33, Mesa, Ariz./Bryan McBride, 31, Mesa Ariz./Mike Jeluso, 39, Aurora, Colo., Can-Am X3, 7:35:45; 3. 2966 Rhys Millen, 45, San Juan Capistrano, Calif. (New Zealand)/Timothy Dunbar, 37, Rancho Cucamonga, Calif., Polaris RZR XP1000 Turbo, 7:55:09; 4. 2904 Scott Sappington, 54, Glendale, Ariz. (DOR-Cory Sappington, 52, Peoria, Ariz.)/Jason Flanders, 38, Phoenix, Ariz., Can-Am Maverick X3, 8:02:19; 5. 2987 Edgar Garcia, 30, Rancho Santa Margarita, Calif., Can-Am Maverick X3, 8:48:18; 6. 2960 Ryan Laidlaw, 38, Saratoga Springs, Utah/Mitchell Sweatt, 34, Bluffdale, Utah, Polaris RZR XP1000 Turbo, 9:01:11; 7. 2916 Cody Rahders, 23, Alpine, Calif./Fernando Ramirez, 30, Polarix RZR XP4 Turbo, 9:14:14; 8. 2937 Alex Nicholas, 27, Highland Village, Texas/Barrett Turner, 27, Highland Village, Texas, Polaris XP1000 Turbo, 9:16:27; 9. 2940 Erick Kozin, 43, Yorba Linda, Calif./Jose Garcia, 32, Can-Am X3, 9:47:23; 10. 2912 Tony Riggs, 49, Newhall, Calif., Polaris RZR, 10:20:26; 11. 2975 Mike Cafro, 48, Fallbrook, Calif./Jamie Kirkpatrick, 37, Olympia, Wash./Pierre-Yves Deneault, Canada, Polaris RZR XP4 Turbo, 10:23:53; 12. 2919 Pat Stone, 49, Phoenix (DOR-Brandon Schueler, 28, Phoenix)/Jason Spiess, 48, Peoria, Ariz., Polaris RZR XP4 Turbo, 10:46:30; 13. 2978 Luis Fortanel, 29, Mexicali, Mexico/Jose Ramirez, 28, Mexicali, Mexico, Can-Am Maverick X3, 11:44:17; 14. 2900 Tim Orchard, 62, Riverside, Calif. (DOR-Marc Burnett, 46, Lakeside, Calif.)/Bobby Smith, Can-Am Maverick X3, 12:35:03; 15. 2910 Scott Trafton, 36, Santee, Calif./Dave Price, 60, Alpine, Calif., Polaris RZR XPT1000, 12:50:39; 16. 2922 Aldo Salazar, 32, Monterrey, Mexico/Oscar Salazar, 33, Monterrey, Mexico/Maricio Soto, 24, Monterrey, Mexico, Can-Am X3, 13:17:13; 17. 2950 Rogrigo Elorduy, 36, Mexicali, Mexico/Ivan Pacheco/Carlos Aguirre, Polaris RZR XP Turbo, 13:46:55; 18. 2946 Jose Juarez, 34, Chula Vista, Calif./Rudy Rivera, 30, Chula Vista, Calif., Polaris RZR XP1000 Turbo, 15:15:29. PRO UTV (two-seat Normally Aspirated, OEM engine UTVs)—1. 1954 Kristen Matlock, 37, Alpine, Calif./Matt Strandberg, 34, Ramona, Calif., Polaris RZR XP4 1000, 7:28:02 (42.72 mph); 2. 1955 Paul Champion, 46, Phoenix/Travis Casteel, Phoenix, Polaris RZR XP1000, 9:17:21; 3. 1995 Travis Wells, 46, St. George, Utah (DOR-Kaden Wells, St. George, Utah)/Jesus Gutierrez, 31, Ensenada, Mexico/Rory L’Hommedieu, 37, Mesquite, Nev., Polaris RZR, 10:06:29. CLASS 5-1600 (1600cc VW Baja Bugs)—1. 553 Cesar Iniguez, 33, Mexicali, Mexico/Victor Iniguez, 27, Mexicali, Mexico/Emilio Salcido, 40, Mexicali, Mexico/Omar Arellano, 33, Mexicali, Mexico/Miguel Estrada, 26, Mexicali, Mexico, 12:11:45 (26.16 mph); 2. 577 Luis Herrera, 37, Granada Hills, Calif./Ernie Negrete, 45, Chula Vista, Calif./Jorge Torres, 38, Tijuana, Mexico/Michael Murray, 38, Escondido, Calif./Jim Yourdon, 42, Bend, Ore., 12:28:50; 3. 557 Mario Ledezma, 48, Ramona, Calif./Ruben Ledezma, 45/Ruben F. Ledezma, 17/Justin Ledezma, 18, 13:38:48. BAJA CHALLENGE (Spec, Subaru-powered Baja Touring Cars)—1. BC1 David Payne, 57, St. Louis, Mo., 10:18:17 (30.96 mph). PROTRUCK (Spec Production Trucks, V8 engines)—1. 1377 Jason Vandenborn, 43, Canada/Kendall Ballentine, 31, Canada, Ford F-150, 12:25:59 (25.66 mph). STOCK FULL (Stock, Full-sized Trucks)—1. 8125 Marc Stein, 51, Hemet, Calif./Jared Durnberger, 32, Hemet, Calif./Mike McComas, 52, Hemet, Calif./Cooper Reynolds Gross, 35, Los Angeles, Ford F-150, 13:07:47 (24.30 mph). CLASS 11 (stock VW sedans, safety modifications)—1. 1156 Art Penner, 61, Lynden, Wash. (Canada)/Marco Carmona, 67, Ensenada, Mexico, 12:31:22 (25.47 mph); 2. 1100 Dennis Hollenbeck, 57, Ensenada, Mexico/Armando Salazar, 32, Ensenada, Mexico/Kevin Schlect, 57, Tehachapi, Calif./Luis Vazquez, Ensenada, Mexico, 12:38:36; 3. 1149 Victor Esparza, 29, Tijuana, Mexico/Adrian Esparza, 44, Tijuana, Mexico/Christian Gomez, 35, San Diego, 15:45:20. SPT STOCK UTV NA—1. 3975 Torrey Rush, 27, Gillette, Wyo./Clint Petersen, Gillette, Wyo., Yamaha YXZ1000, 11:25:44 (27.91 mph). PRO MOTO UNLIMITED (400cc or more)—1. 7x Justin Morgan, 28, El Cajon, Calif./Mark Samuels, 28, Yucca Valley, Calif., Honda CRF450X, 6:04:33 (52.50 mph); 2. 66x Santiago Creel, 31, Mexico City, Mexico/Brandon Prieto, Ensenada, Mexico/Didier Giorand, Mexico City, Mexico/Roberto Villalobos, Tecate, Mexico KTM 450EXCF, 6:35:40; 3. 4x Santiago Creel, 31, Mexico City, Mexico/Mark Winkelman, 59, Cedar Hill, Texas/Austin Miller, 28, Austin, Texas/Braxton Gallian, 21, Cave Creek, Ariz./Ray Dal Soglio, 27, Scottsdale, Ariz., KTM 450EXC, 6:53:47; 4. 1x Shane Esposito, 43, Temecula, Calif./Grant Statley, 23, La Jolla, Calif., Honda CRF450X, 7:02:20; 5. 30x Nic Garvin, 23, Ladera Ranch, Calif./Derek Ausserbauer, 24, Santa Barbara, Calif., Yamaha WR450, 7:04:20; 6. 3x Garrett Poucher, 35, Valencia, Calif./Michel Valenzuela, Tijuana, Mexico/Skyler Howes, Utah/Schuyler Schoonmaker, San Diego, Honda CRF450X, 7:19:56; 7. 55x Steve Hatch, 48, Flagstaff, Ariz./Max Drew/Art Babcock, Honda CRF450X, 8:02:42; 8. 11x Travis Gardner, 33, Incline Village, Nev./Peter Clark, 30, Portland, Ore./Cheyne Shoultz, 29, Portland, Ore., Husqvarna 501, 11:33:00. PRO MOTO 40 (Riders over 40 years old)—1. 400x Jano Montoya, 45, Winter Garden, Fla./Alberto Ruiz, 42, Ensenada, Mexico/Jeff Kawell, 45, Riverside, Calif., KTM 450XCW, 7:57:37 (40.07 mph); 2. 405x Jack McCormick, 48, Garnerville, Nev./Michael Rasp, 49, Henderson, Nev./Eric Rasmussen, 50, So. Lake Tahoe, Calif./Todd Romano, 48, Park City, Utah, Honda CRF450X, 9:10:41; 3. 427x Salvador Sainz, 52, Chula Vista, Calif./Oscar Garcia, 44, Tijuana, Mexico/Jose Gonsales, 50, Tijuana, Mexico/Guillermo De La Herran, 42, Tijuana, Mexico, KTM 450XCW, 10:30:08. PRO MOTO 30 (Riders over 30 years old)—1. 360x Santiago Creel, 31, Mexico City, Mexico/Massimo Mangini, Italy/Kevin Murphy, 42, Camarillo, Calif./Abel Burgeno, Mazatlan/Jim O’Neal, 72, Simi Valley, Calif. /Enrique Fuhrken, Mexico City, Mexico, KTM EXCF500, 8:11:12 (38.97 mph); 2. 300x Ryan Liebelt, 38, Reedley, Calif./Greg Bardonnex, 43, Visalia, Calif./Andrew Puckett, 33, Bakersfield, Calif., Yamaha WR450F, 8:32:15; 3. 303x Luis Gomez, 37, Obregon, Mexico/Joaquin Montero, 41/Manuel Ochoa, 42/Edgar Espinoza, 41, Honda CRF450X, 9:21:01; 4. 333x Chad Thornton, 46, Farmington, N.M./Dennis Belingheri, 48, Reno, Nev./Sal Hernandez, 34, Ensenada, Mexico/Jason Trubey, 43, Henderson, Nev., KTM XCF450, 10:13:47; 5. 304x Chris Racan, 37, Cardiff by the Sea, Calif./Devon Chatterjie, 31, San Diego/Michael Gardner, 32, San Diego, Honda CRF450X, 13:03:01. PRO MOTO 50 (Riders over 50 years old)—1. 510x Giovanni Spinali, 51, El Cajon, Calif./Earl Roberts, 57, Mexicali, Mexico/Troy Pearce, 51, Ramona, Calif./John Griffin, 51, Lake Forest, Calif., Yamaha YZ450FX, 8:17:43 (38.46 mph). PRO MOTO LIMITED (less than 400cc)—1. 100x Santiago Creel, 31, Mexico City, Mexico/Alberto Heredia, Ensenada, Mexico/Larry Serna, Tijuana, Mexico/Ricardo de la Pena, Los Angeles/Massimo Mangini, Italy/Austin Miller, 28, Austin, Texas, KTM 350XCF, 8:10:03 (39.06 mph); 2. 151x Juan Lopez, 30, San Diego/Edgar Cota, 20, Chula Vista, Calif./Julio Ramirez, 27, San Diego/Adrian Valdez, 46, Tijuana, Mexico/Jake Lindquist, 27, San Diego/Arnulfo Verdugo, 26, San Felipe, Mexico, KTM 350CXCF, 8:52:33; 3. 121x Ana Rivas, 24, Mexicali, Mexico/Ricardo Reyes, 24, Mexicali, Mexico/Brandon Banuelos, 23, Mexicali, Mexico/Jhoun Sanchez, 31, Mexicali, Mexico/Christian Sanchez, 35, Mexicali, Mexico/Jorge Rivas, 21, Mexicali, Mexico, KTM 250EXC-W, 9:41:23. PRO MOTO IRONMAN (Solo Riders)—1. 730x Francisco Septien, 42, Ensenada, Mexico, KTM 450EXCF, 7:51:13 (40.62 mph); 2. 706x Kevin Daniels, 50, Bishop, Calif., Honda CRF450X, 9:18:51; 3. 725x Kenny Wilson, 31, Ojai, Calif., KTM 450EXCF, 9:22:19; 4. 741x Carlos Gracida, 43, Guadalajara, Mexico, Husqvarna FX450, 9:27:41; 5. 752x Hector Gutierrez, 24, Potrero, Calif., Honda CRF450X, 10:42:39; 6. 722x Liz Karcz, 33, Albuquerque, N.M. (New Jersey), Honda CRF450X, 12:08:46; 7. 714x Lawrence Janesky, 53, Seymour, Conn., Honda CRF450X, 12:24:51. PRO QUAD (Open engine displacement)—1. 15a Juan Sanchez, 44, Chula Vista, Calif./Javier Corona, 37, San Diego, Honda TRX450R, 8:57:51 (35.59 mph); 2. 1a Said Sanchez, 31, Tijuana, Mexico, Honda TRX450R, 14:51:30. SPT M/C—1. 255x Alvaro Bello, 29, Spring Valley, Calif./Manuel Gomez, 26, Tecate, Calif./Humberto Valle, 37, Tecate, Calif./Jorge Garcia, 30, Tecate, Calif./Christian Salinas, 34, Tecate, Calif., Kawasaki KXF450, 9:17:40 (34.32 mph); 2. 238x Rolando Cabrera, 28, Ramona, Calif./Giovani Solorio, 29, Ensenada, Mexico/Marco Higuera, 31, Ensenada, Mexico/Gerardo Cabrera, 24, Ramona, Calif., KTM 450EXC, 9:26:04; 3. 284x Shane Schorno, 31, Discovery Bay, Calif./Don Crane, 38, Brentwood, Calif./Brian Mes, 38, KTM 500EXCF, 9:33:01; 4. 201x R. Hank Salyer, 47, Steamboat Springs, Colo./Scott Borden, 46, Steamboat Springs, Colo., Yamaha YZ450X, 9:35:46; 5. 200x Miguel Pena, 42, Tijuana, Mexico/Jorge Carbajal C., Tijuana, Mexico/Jorge Carbajal A., Tijuana, Mexico/Jose Vargas, Tijuana, Mexico, Honda CRF450X, 9:36:55; 6. 213x Bradley Loveday, 50, Alamo, Nev./Joey Amey, 46, Las Vegas/Rhett Ogden, 45, Las Vegas, Honda CRF450X, 10:00:52; 7. 287x Alexis Velarde, 18, National City, Calif./Brian Whipperman, Ensenada, Mexico/Joshua Whipperman, Ensenada, Mexico, Honda CRF450X, 10:02:54; 8. 215x Michael Rodriguez, 21, Tijuana, Mexico/Luis Esquivel, 39, Tijuana, Mexico/Hugo Gallardo, 44, Tijuana, Mexico/Mijael Juarez, 26, Tijuana, Mexico/Oliver Gamez, 26, Tijuana, Mexico, KTM 250XC, 10:03:56; 9. 205x Nick Jimenez, 24, El Cajon, Calif./Wyatt Holmes, 19, Alpine, Calif./Sean Pebbles, 18, Santee, Calif., Honda CRF450X, 10:10:42; 10. 278x Aki Polvikoski, 48, Glen Cove Springs, Fla. (Finland)/Risto Niemi, Finland, Yamaha WR450F, 10:41:14; 11. 212x Carlos Silva, 41, Mexicali, Mexico/Oswaldo Moncada, 25, Ensenada, Mexico/Joe Leal, 45, Mexicali, Mexico/Fernando Cardenas, 26, Mexicali, Mexico/Carlos Castillo, 28, Mexicali, Mexico/Carlos Silva Jr, 24, Mexicali, Mexico, Honda CRF450X, 11:38:41; 12. 216x Luke Berlet, 39, Steamboat Springs, Colo., Kawasaki KLX450R, 11:46:01; 13. 261x Mark Minney, 56, Kula, Hawaii/Swayd Gomes, 20, Kula, Hawaii/Wendy Boyd, 49, Huntington Beach, Calif./Christopher Boyd, 51, Huntington Beach, Calif./Jeremy Swallow, 47, Hungtington Beach, Calif., KTM450XCW, 12:04:35; 14. 223x Mike Mettler, 43, Kuna, Idaho/Sam Neva, 30, San Diego/Mark Henderson, 44, Stockton, Calif./Scott Macias, 53, Livermore, Calif./Dan Mastrude, 37, Boise, Idaho, Yamaha YZ450FX, 12:12:24; 15. 293x Gabriel Barrios, 31, Tijuana, Mexico/Adrian Cruz, 36, Tijuana, Mexico/Gabriel Camarena, 33, Tijuana, Mexico/Karl Zeilik, 42, San Diego, Honda CRF450X, 13:10:26. 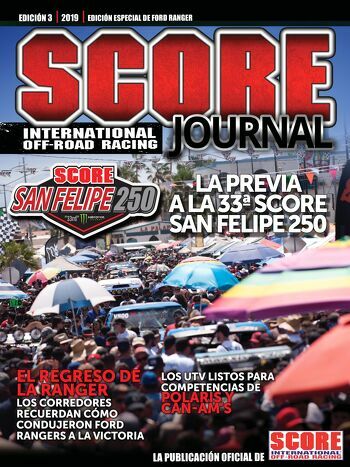 Next ArticleRob MacCachren Wins the SCORE San Felipe 250!